Prehistoric Week: Doctor Who PERSUED BY THE TRODS | Warped Factor - Words in the Key of Geek. Eek! This TV Comic strip is everything that was wrong with Doctor Who spin off material in the 1960s. It bears only the slightest resemblance to what was being broadcast on television and is clearly pitched below the intelligence level of the average 6 year old. Doctor Who, John and Gillian find they are being pursued by another time and space machine. Doctor Who surmises that it can only be the…Trods! The TARDIS materialises in Stone Age Britain in, according to their handy year-o-meter, 500,000 BC. The trio are keen to experience whatever the Stone Age has to offer seasoned time travelling tourists but are confronted by a herd of mammoths. Fortunately, Doctor Who’s recorder/flute playing makes the mammoths happy. Doctor Who then gets captured by the Trods but before they can atomise him, he plays his recorder/flute and the mammoths crash into the Trods’ ship and rescue him. He then uses the mammoths to destroy the Trods’ static electricity supply and they are rendered powerless. Doctor Who, John and Gillian head off for their tour of Stone Age Britain with no Trod pursuers to worry about. The Trods are a blatant rip-off of the ‘far-too-expensive’ Daleks: they run on static electricity and have a time/space machine which they are using to pursue Doctor Who. They speak in a strange manner; their last word is apparently elongated letter by letter with the speech bubbles being written l-i-k-e-t-h-i-s. Their plan is ludicrous and the way they intend to dispose of their greatest enemy owes far more to the 60s Batman series than anything broadcast on BBC1 under the title of Doctor Who. Doctor Who’s only character quirk is his recorder playing which, ridiculously, tames and summons wild mammoths. (As a former flute player, I have always balked at the supposedly interchangeable terms of recorder and flute…the Second Doctor plays a recorder NOT a flute). John and Gillian are odd characters who were introduced in the very first Doctor Who comic strip in TV Comic, The Klepton Parasites, originally appearing as Doctor Who’s grandchildren. When William Hartnell was replaced by Patrick Troughton on television, and the Second Doctor began to appear in TV Comic, they remained but oddly, their relationship no longer seems to be familial as they only ever refer to the character as Doctor or Doctor Who rather than grandfather. 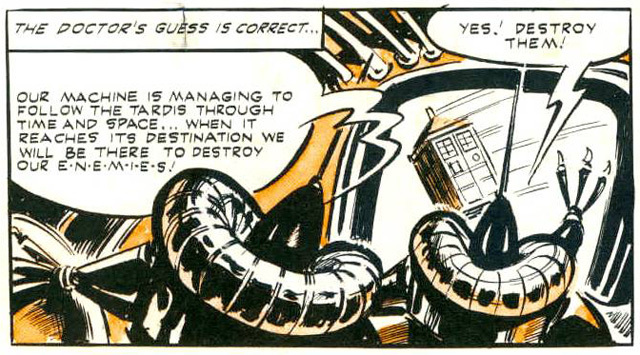 In this strip, as in many others, they do absolutely nothing except follow Doctor Who around. 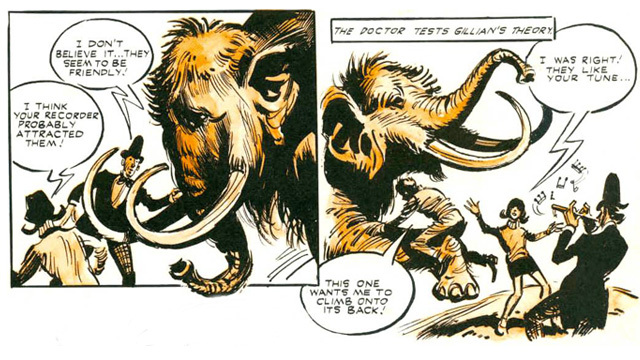 Indeed, in many other strips they get told to stay in the TARDIS – at least here they get to tour Stone Age Britain, which is presented as a land of mammoths. There is little other detail about the time and place in either the plot, dialogue or artwork. The trio’s unseen tour of the area may have been more interesting than the tale we read!